Careers - The Campus of the Jewish Home of Greater Harrisburg, Inc. If you are passionate about caring for others…JOIN OUR TEAM! The Campus of the Jewish Home of Greater Harrisburg invites YOU to join our team and GROW WITH US in your career. At the Campus, we are dedicated to taking care of our entire community! We serve people of all faiths. We strive to enhance the lives of our residents by creating a homelike environment with unique programming to meet each residents’ specific needs. We are seeking talented, dedicated individuals who are interested in a career in nursing. By joining our team, you will be provided with opportunities to obtain your CNA certification, LPN license and RN license with many internal opportunities and room for growth. The Campus takes pride in all of our employees and highly encourages internal growth opportunities! 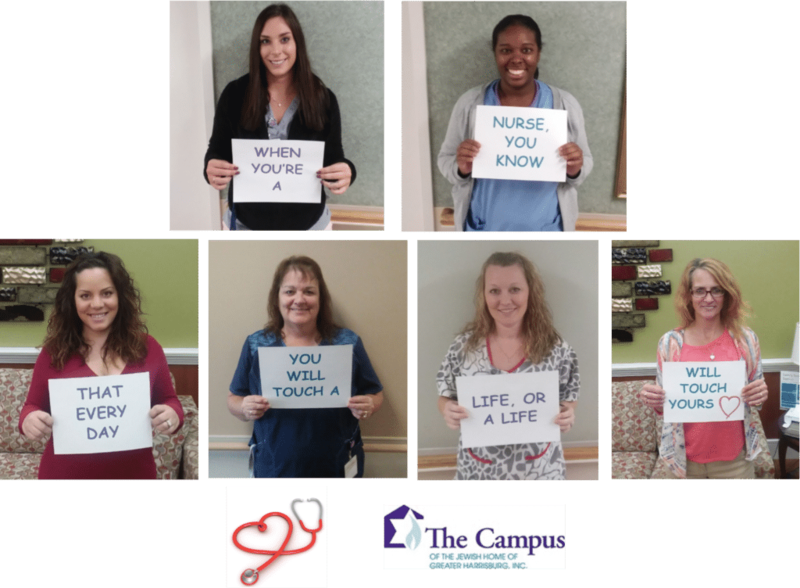 The Campus is always looking to enhance the quality of care we provide and add to our team who serve our loved ones. CNA, LPN, RN – does not matter what level, if you have an empathetic heart and knack for providing quality care; if you have answered the calling to serve, please complete an application and come see what sets our staff apart. Please check back for the next upcoming Job Fair to be held by The Campus. Please see this list for a complete listing of open Nursing Positions. The Campus is in search of the right people to serve in the position of LPN for both the Personal Care (The Residence) building as well as the Skilled Nursing (The Jewish Home). All shifts are possible, including Full Time, Part time and Weekend options. (The Residence is a .4 position, night shift position). If interested, please contact Connie at clagasse@jhgh.org. The Campus is looking to hire both a FT as well as a PT Maintenance person to join our team! Positions are for day shift and a wonderful opportunity to do what you love while making a difference every day. Some experience preferred. Please send resume to Mike at mheilman@jhgh.org or complete an application below. The Campus is looking to hire a part time payroll clerk that includes 24 hours a week. Responsibilities include but are not limited to duties such as making corrections to existing payroll records for electronic punches, maintain spreadsheets, prepare general ledger, and producing bi-weekly payroll. For a complete outline of position description please see this link; to apply send resume to Connie at e-mail below or use the electronic application form. Feel free to send resume to Connie Lagasse at clagasse@jhgh.org or follow up to an application by calling 717-441-8507. Walk-ins welcome between 8:00 a.m. and 5:00 p.m. weekdays!